Pop. 1,228. In Alfred T., Prescott and Russell Cs., on C. Rd. 17, 63 km. E of Ottawa. Pop. 964. 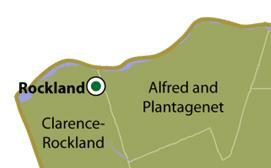 In North Plantagenet T., Prescott and Russell Cs. on the Nation R. and C. Rds. 9 & 17, 64 km. NE of Ottawa. Pop. 223. 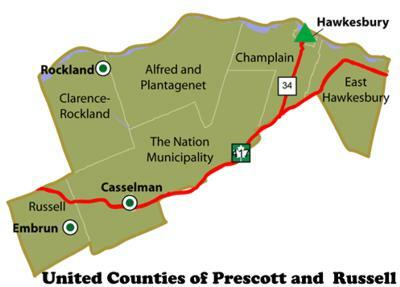 In South Plantagenet T., Prescott and Russell Cs., on Paxton Cr., a branch of the South Nation R. on C. Rds. 10 & 15, 66 km. E of Ottawa. In West Hawkesbury T, Prescott& Russell Cs. on Hwy. 34, 8 km S of Hawkesbury. Pop. 2,030. 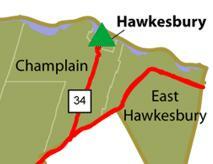 In West Hawkesbury T., Prescott and Russell Cs., on Hwy 34 and C. Rd. 10, 83 km NE of Ottawa.